This post is part of the Last 100 Days of 2016 Series. As of today there are 60 days left in 2016, what will you do with them? 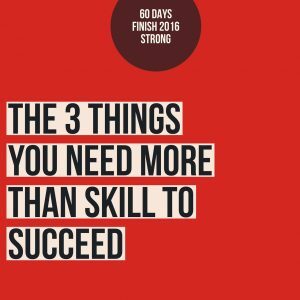 You may have the degree, knowledge and skills but if you are missing these three critical traits all of that won’t be enough. It’s one thing to know and understand the things you’ve been taught but life gets real, real quick, when the rubber meets the road. There are three things you must possess and practice IN ADDITION to your knowledge and skills. There’s no such thing as an overnight success. There’s not a magic pill or silver bullet that launches you into your dream life. There isn’t a shortcut or formula that allows you to fast forward into success. The bottom line and what no one likes to hear is that life will always require you to be patient and that’s not a bad thing. When satisfaction is delayed the appreciation you feel and gratification you have means a lot more. When you have to wait for something it forces you to come up with creative alternatives. Change your perspective on patience and let patience change your perspective. The ability to stick with something has become a rare commodity. Where are those still say, “when the going gets tough, the tough get going?” Do you let yourself off to easy when something becomes too challenging? Do you back down when things don’t go your way? Have you thrown up your hands and “surrendered” when you can’t do something? It’s a hard fact but life requires you to become persistent. Whether you like it or not you have to develop persistence in life. Persistence begins in your mind and makes the decision, over and over again that you will not quit, that you will not give up. Hustle and grind may be overused and considered cliche’ but they are still great words to describe what you have to do day in and day out to succeed in anything. Life requires hard work. To become successful in anything; job, relationships, finances or health it’s going to take sacrifice, hard work and perspiration. Don’t misunderstand me, I’m not saying ignoring your loved ones and trading your health for longer hours on the job is what you need to be doing seven days a week. No doubt, there are seasons throughout life that require long hours. There are times in our life that will require more sacrifice than others. But, those seasons are just that, a season and seasons change. Make the decision right now, maybe even say it out loud, that you will embrace patience, become persistent and sweat to achieve what you set out too. You have it in you, don’t hold back, push through resistance to see what happens when these three things become part of who you are and how you approach life.